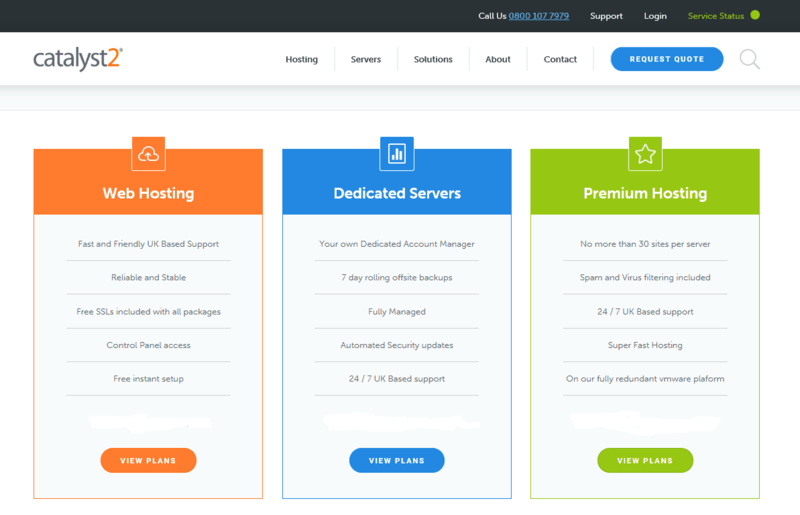 Catalyst2 Review 2019: Is Catalyst2 a Good Hosting? catalyst2 offers both Windows and Linux shared hosting with a basic set of features. Their plans are a bit light on storage, potentially limiting those wanting to host larger websites or those needing to support large databases. Since 2000, catalyst2 has been offering web hosting services to the U.K. and clients around the world. They’ve won multiple awards for their services and are known in the industry for their stable and reliable shared web hosting, VPS, and dedicated server products. For shared hosting, catalyst2 offers both Windows and Linux hosting on redundant cloud servers, with features appropriate for many personal and small business websites. Note that while they support PHP, CGI, and some other scripting languages, they don’t appear to support Python or Ruby on Rails, which is a bit unfortunate. If you’re a rank beginner, there’ll be a bit of a learning curve with this platform as they don’t offer a website builder. The one-click installer is helpful, but you’ll need to learn how to manage the platform you choose. For those with experience, you can use cPanel for Linux or Plesk for Windows hosting to manage your website. These features are the same regardless of whether you get Windows or Linux hosting. I’m not a fan of the storage on these plans, but the bandwidth is more than ample. Pricing is relatively average on these plans, but note that the Mega Deal plan only offers annual billing. For all other plans, you can pay monthly or annually with a slight discount for annual plans. All plans come with a 30-day money back guarantee. If you plan to run a WordPress website, you do also have an option to purchase WordPress hosting with plans ranging from 10GB to 30GB of SSD storage. However, the plans are costly compared to standard hosting. I only recommend going that route if you’re an absolute beginner and need help managing WordPress. They offer unlimited support for these, although the account doesn’t come with WordPress pre-installed; you’ll still have to use Fantastico to do a one-click installation of WordPress. catalyst2’s customer support is slightly above average with toll-free phone support and ticket support. They also offer a robust knowledge base along with a service status update page that reports on known outages. catalyst2 is a good website host if you have small personal and business websites. However, if you have a website requiring significant storage, such as those needing to host multiple large databases, your best bet is to go with one of their cloud, VPS, or dedicated server packages rather than any of their shared hosting plans. Also, those looking for managed WordPress hosting may want to look elsewhere as the WordPress hosting plans are a bit pricey. Wondering how Catalyst2 stacks up against other Web Hosting companies? Enter any other Web Hosting company and we will give you a side-by-side comparison.